Welcome to Day #6 of Chocolate and Hazelnut Theme Week. 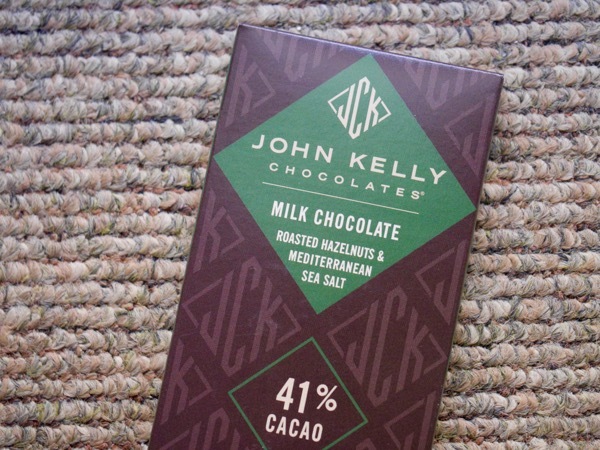 This Milk Chocolate with Roasted Hazelnuts and Mediterranean Sea Salt bar was from John Kelly Foods, Inc.* (Hollywood, CA). Forty-one seems to be the magic number today. The bar was purchased at Studio 41 (Benicia, CA). 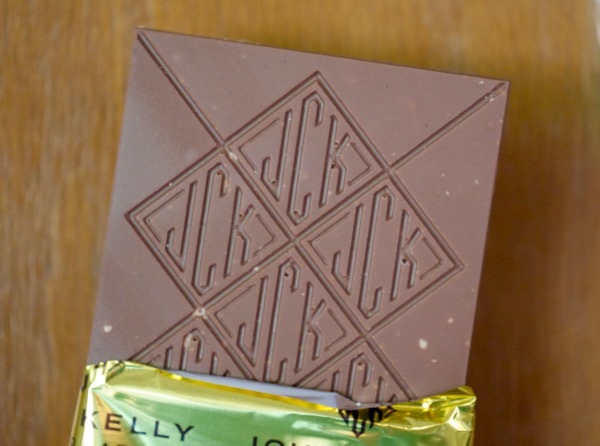 And this slim, monogrammed bar had a pleasant chocolate hazelnut spread aroma and flavor. Made with creamy 41% cacao, fair trade certified, milk chocolate, dry roasted hazelnut bits added crunchy texture throughout the gluten-free bar. The amount and distribution of Mediterranean sea salt was subtle and well balanced, i.e. there weren't areas with too much salt; however, the salt was not 100% homogeneous, so you had very tiny reminders of salt content now and then. The bar had stayed fresh in the sealed, gold foil wrapper, which was nice as well, as it had been more than 41 days since I purchased this bar. 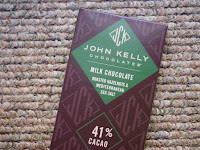 *Founders, John and Kelly, opened up their chocolate factory in Hollywood in 2004, armed with a fudge recipe. They've since expanded to other chocolate offerings.